Vysehrad, the famous historical fort located in the very heart of Prague, belongs among the most significant National Cultural Monuments of the Czech Republic. According to a legend, the castle, built on a hill above the Vltava river, was the first seat of Czech dukes. Nowadays, apart from an amazing view of Prague, it shelters many architectural treasures. The whole Vysehrad complex is huge and features many parks and narrow streets where you can easily escape from the tourist crowds. Luckily, the area is not that touristic and you can enjoy a peaceful Sunday walk. 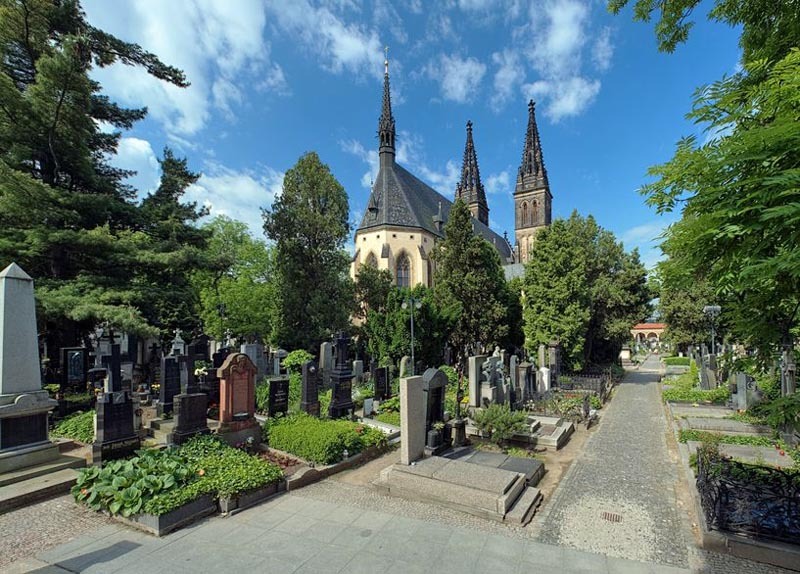 Echoing magnificent history, being the burial site of many famous Czech people and offering countless sights, Vysehrad retains its magical atmosphere and an aura of mystery in the 21st century. It is no wonder, then, that the castle is visited by countless tourists every year, offering them one of the most beautiful views of the Prague panorama, a great place to rest, and opportunities to discover the cultural and spiritual wonders of Prague. The castle on top of the Vysehrad Rock, originally called Chrasten, was founded in the 10th century. It was actually later than the origins of Prague Castle, but Vysehrad is ridden with folklore and legends, accrediting a deeply fascinating history to it. Vysehrad is thus connected to such beautiful legends as the one about the legendary founder of Prague itself, the princess and prophetess Libuše (also known as “Libussa” or “Lubossa”). It was from her seat in Vysehrad that Libuše allegedly stated her prophecy about the future glory of Prague. Or let us mention the wonderful story of the “maiden’s war”. This Bohemian traditional tale tells of an uprising of women against men and appeared in writing for the first time in the Chronica Boëmorum of Cosmas of Prague, in the 12th century. Part of the story is an invitation to Vysehrad, where the men wronged the women resulting in a final fight. Nevertheless, the “real” history of Vysehrad is itself far from boring. 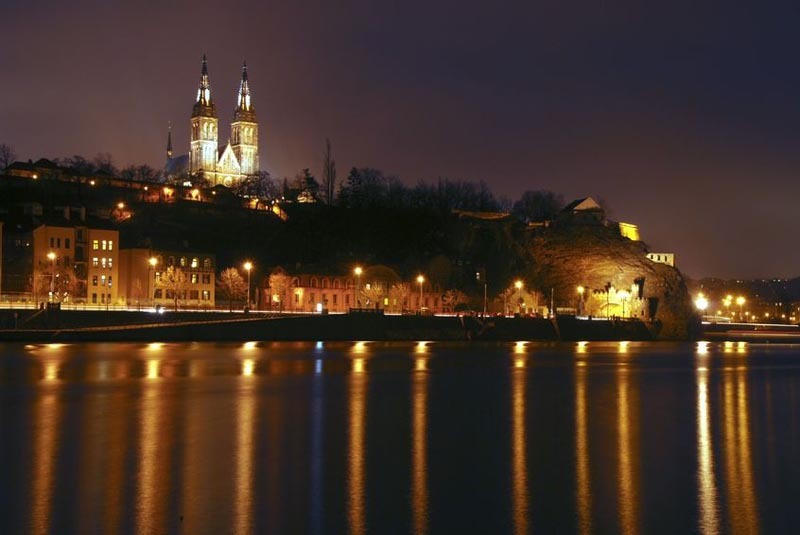 The hill-fort of Vysehrad was founded at the end of Boleslaus II the Pious’ (“Boleslav II. Pobožný” in Czech) reign, around 990 AD. The most glorious period of the Vysehrad’s history belongs, however, to the 11th century, when it became the seat of the first Czech king and his ancestors. Then, in the 14th century, the famous King of Bohemia and Holy Roman Emperor Charles IV decided to bring Vysehrad back to its historical glory, in deference to his Přemyslid ancestors. Among other things, he added a pilgrimage to Vysehrad to the Czech king’s coronation process. Over the centuries, other Czech rulers have brought glory to Vysehrad, having numerous architectural gems built there. In 1962, the area of Vysehrad was declared a National Cultural Monument, and nowadays it is operated by an autonomous cultural organization. 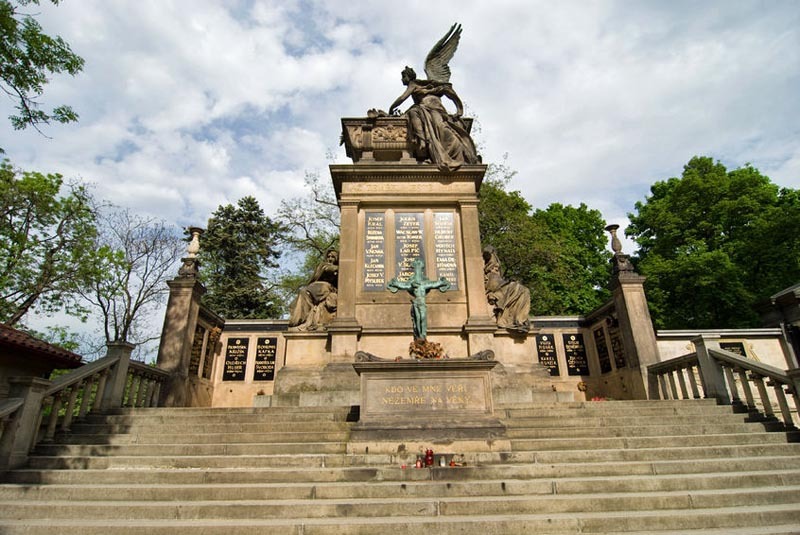 One of the most visited places at Vysehrad is Vysehrad Cemetery and its famous tomb Slavín. The tomb, built at the end of the 19th century, became the final resting place of many significant Czech people. The first one buried there was the poet Julius Zeyer, later joined by sculptor Josef Václav Myslbek, painter Alfons Mucha, and one of the historically most popular Czech actors, Jaroslav Marvan, to name but a few. Originally, there used to be a small cemetery (from the 13th century) at Vysehrad. In the 1970s, it was turned into a national burial site, and nowadays the cemetery takes up an area of around 0.8 hectares. The most beautiful parts of it are probably decorated arcades built around the cemetery in Italian style, with Tuscan pillars and marble tombs on the southern and eastern sides. 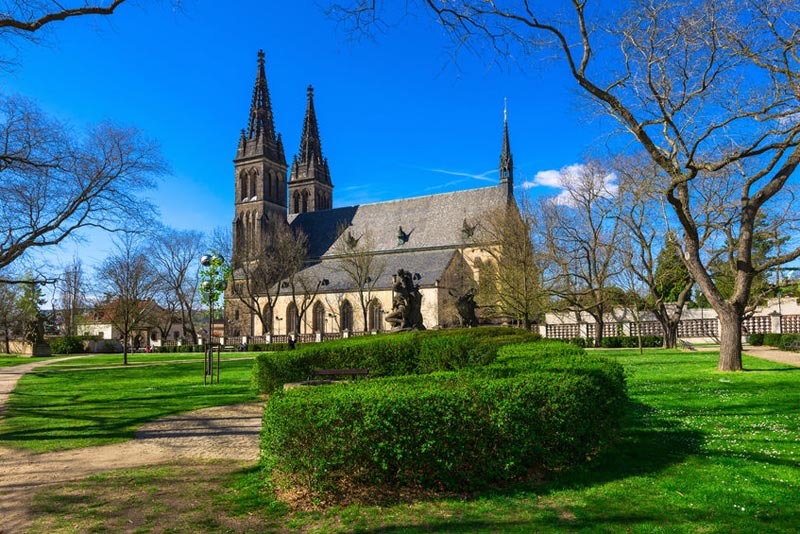 Among the numerous architectural gems of the Vysehrad fortress, the Neo-Gothic church called the “Basilica of St. Peter and St. Paul” attracts many visitors. The church of two apostles was originally built at the beginning of the 11th century as a Romanesque basilica, and in 1249 it was damaged by fire and rebuilt in the Gothic and later Neo-Gothic style. Nowadays, it is a three-aisled basilica with chapels at the side aisles. At the sides of the façade, there are dyads of towers. The façade is sophisticatedly decorated. The interior of the Basilica is richly decorated with ornamental and figural wall paintings in the Art Nouveau style. The treasury houses jewellery and rare textiles of the Vysehrad Chapter exhibition. During the Christmas season, you can see a magnificent Bethlehem (picture of the Nativity) in the Basilica. It consists of 13 whole-length figures, carved from wood and polychrome decorated in the post-Renaissance style. Also, do not miss the famous panel-painting of the Virgin Mary of Rain, the amazing bells and chimes or pipe organ, extending for the full length of the choir loft. The Vysehrad fort is also a home of one of the oldest surviving buildings of Prague – the Rotunda of St. Martin. The smaller, Romanesque building with its circular platform and horseshoe-shaped apse was built in the 11th century, and belongs among the oldest and most significant buildings of its kind in the Czech Republic. When you visit, pay attention to a Neo-Romanesque stone portal inscribed with the writing: “SANCTE MARTINE ORA PRO NOBIS” (“Saint Martin, pray for us!”). Also, seeing the altar painting of Saint Martin in pontifical robe and the semicupola with a painting of Christ surrounding by angels both offer an amazing experience. The address of the National Cultural Monument Vysehrad is V Pevnosti 159/5b, 12800, Prague 2, but the fort can be hardly missed. It is located on a rocky promontory above the Vltava River, in the eponymous Prague district. Also the name (meaning “upper castle” in Czech) suggests, that you will find the castle up high. To get to Vysehrad, you can go to the “Vysehrad” metro station, or “Albertov” or “Výtoň” tram station. The opening hours of Vysehrad are 9:30 am – 5 p.m. from November until March and 9:30 am – 6 p.m. from April until October, and it’s open to the public every day. There is no entrance fee to the area, but you need to pay to visit the exhibitions – The Old Burgrave’s Residence for 60 CZK, Vysehrad Gallery for 20 CZK, The Brick Gate and Casemate for 60 CZK, and The Gothic Celler for 50 CZK. There is also a quite rich offer of commented tours in several languages.